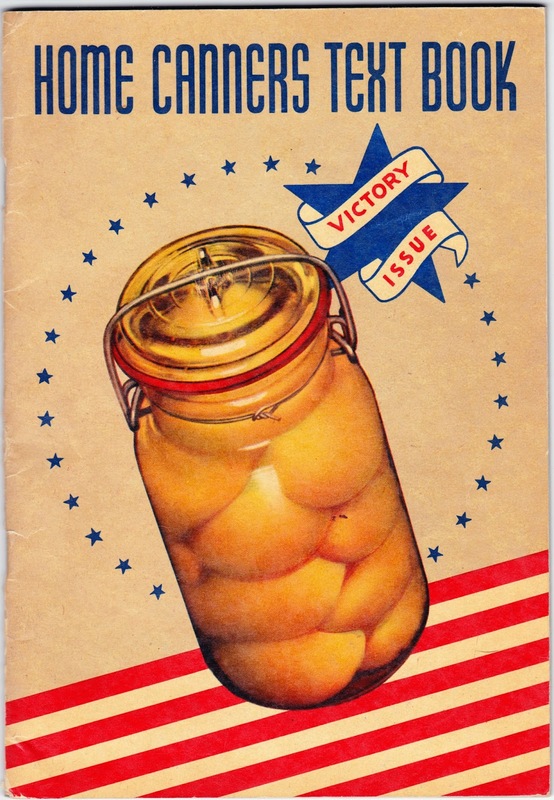 I love this cover from the "Victory Issue" of Home Canners Text Book, which was published in 1943 by the Boston Woven Hose & Rubber Co. and sported a price of 15 cents. The 64-page staplebound booklet comes with this motto from Secretary of Agriculture Claude R. Wickard: "Food will win the war and write the peace." You can read a good history of the Boston Woven Hose & Rubber Co. on the Cambridge Historical Society website. During its many decades of operation, the company's products included garden hoses, fire hoses, bicycle tires, rubber rings, rubber mats and tubing. This booklet includes a wealth of canning tips, recipes and insight into the process of making and jarring jelly. It has you covered for everything from lima beans to elderberries to marmalades to mincemeat to piccalilli. It even has a section with tips on canning meat, fish and poultry. For example, one should "kill chickens at least 6 hours before they are to be canned, in order to allow time for heat to the leave the body." The canning of live chickens is strongly discouraged. Here's a recipe from the booklet for Cherry Marmalade. Weigh out 2 pounds pitted cherries. Add 2 cups water and 3 cups sugar. Add juice and grated rind of 1 lemon and 1 orange. Adjust jar rings on clean, hot jars. Wipe of jar wings with clean, damp cloth. 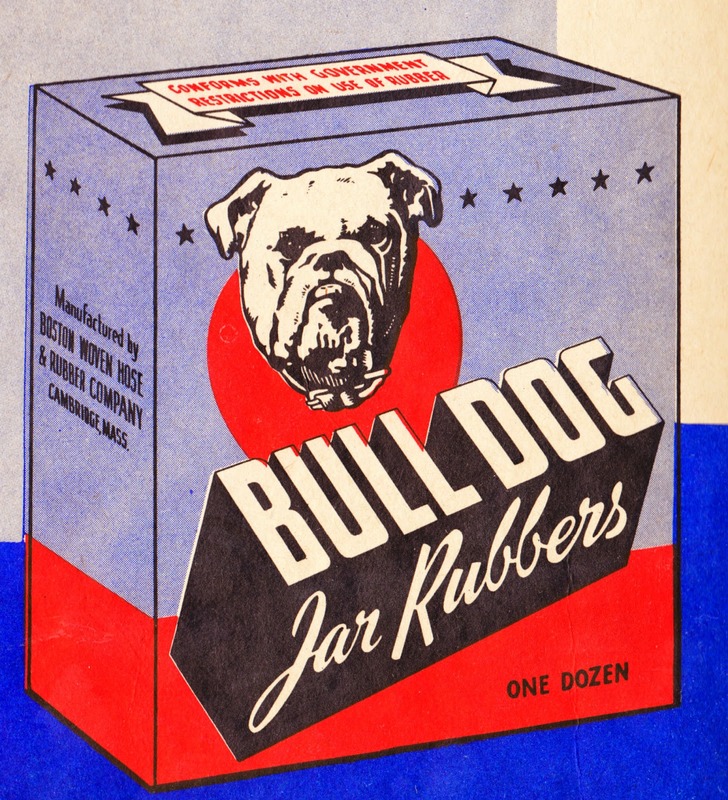 Finally, here's an image from an advertisement for Bull Dog Jar Rubbers that appears on the inside back cover of the booklet. "Our Bull Dog Rubbers are made to conform with Government restrictions on use of rubber and are perfectly satisfactory for all known methods of canning. When you buy Bull Dog rubbers you are sure of getting the highest quality of jar rings which it is is possible to make." 1. Here's the Jelly Test: "Dip the spoon in the jelly mixture, then let the mixture run off the side of the spoon. At first it will act like water, running off in a single stream. Later, two streams will form. Finally the two streams will merge1 and form a 'sheet' which will shear away from the edge of the spoon. When this stage is reached remove the kettle from the heat, skim, and pour into glasses immediately." 1. You'll have to disregard the fact that I told you to never cross the streams.